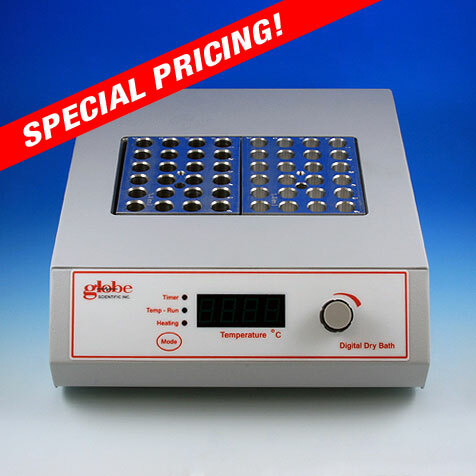 Globe’s digital dry baths are designed to keep samples at preset temperatures up to 150°C. They offer digital control over both temperature and time, eliminating the need for an external thermometer or timer. Available in three configurations, the digital dry baths offer capacity for up to four blocks. These models are extremely space efficient - with the largest model holding up to 96 x 1.5mL tubes and taking up less than a square foot of bench top space. All Globe dry baths offer a built-in user recalibration function to guarantee long term temperature accuracy. Each dry bath also includes an easy to use block lifter with a temperature insulated handle for quick, convenient exchange of blocks. Note: Blocks are sold separately. (W x D x H): Single Block: 7.8" x 9" x 3.2"
Double Block: 8.7" x 10.3" x 3.2"
Four Block: 8.7" x 14" x 3.2"